Alongside a heart that is committed to healing, found in each and every one of us is a soul impassioned to inspire through art. 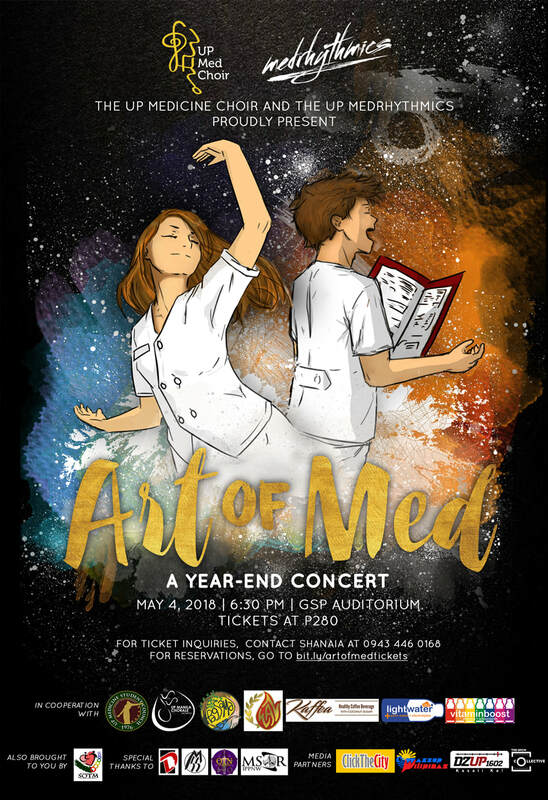 As we step out of the normal rhythm of medical school, let us show you a different kind of healing through melodies and choreographies woven with the colorful patterns of life. This May 4, 2018, 6:30 PM, at the Girl Scouts of the Philippines Auditorium, Padre Faura, Manila. Tickets are priced at P280. You may reserve your tickets through this link: http://bit.ly/artofmedtickets. For ticket inquiries, kindly contact Shanaia Daguit at 0943 446 0168. See you there! MedChoir is going to BALI! It is with great pleasure that we announce that the UP MedChoir will be competing at the 7th Bali International Choir Festival this July 24-28 to be held in Indonesia! Last December 8, the UP MedChoir successfully held their first-ever Christmas concert, Himig ng Pasko, for the benefit of PGH patients. The choir sang solemn and joyful songs celebrating the birth of Christ, soothing and uplifting the hearts of the audience. It was a night filled with joy, music, and giving. Last December 11 and 12, the choir also brought the Christmas cheer to the wards of PGH as they distributed hygiene kits to the patients and sang Christmas carols. University of the Philippines Medicine Choir official website is licensed under a Creative Commons Attribution 3.0 Philippines License.